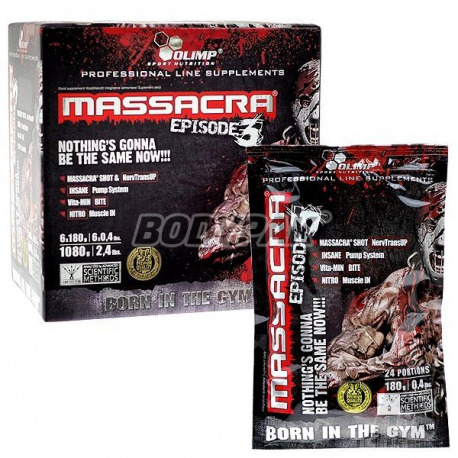 Olympus Massacra 3 is a new, more powerful edition of this popular pre-workout product. In the formulation, ingredients for improving pump, motivation, stimulation. Highest quality! In the professional world it's all about training at the highest level of commitment, maximum amplifying impetus to the effort adaptation powerful muscles. You can not afford to have bad days. It's overwhelming determination breaks down barriers unattainable. Therefore MASSACRA® Episode 3 is the smartest choice when it comes to unwavering motivation, absolute focus and tear on the pump training. Give to devour perfect skomponowanemu composition, quality and his experience. Something like this has ever tried, and from now on everything will be compared to MASSACRA® Episode 3! MASSACRA® Episode 3 - always one step ahead of the expectations of the most demanding. MASSACRA® Episode 3 has deklasować, crush and rozpiep..ać fine dust your weakness, lack of consistency and strong will for training. Leaves no illusions. Or are you ready for it, or take the pink slippers and sit in front of the TV, if you do not have the guts to try it out. Olimp Sport Nutrition® offers you a unique fascias collected exploding whole. Straight from the most modern laboratories. Tested and recommended by elite athletes Olimp Team. The components of this blendu to instantly motivate you to action, to activate the synthesis of neurotransmitters in the central nervous system, extend and strengthen the action of adrenaline. You already have the desire, which now can not leave you. Therefore, further elements MASSACRA® Shot & NervTransUP start sourcing energy stored in adipose tissue, ensuring its uninterrupted supply to the end of hard training. Ingredients with adaptogenic and stabilizing intracellular pH does not allow you to feel tired, and train the growing euphoria starts to rush, effectively severing you from dekoncentrującego buzz around the world. WELCOME TO HELL! NOW WE CAN START THE REAL MADNESS! "Madness" ... yeah .. that's a good word to describe the pump that starts to drill down your muscles. Oxygen system nitric oxide production begins to operate as a first-we give you substrates for the production of catalysts and enzymes that control these reactions. But when you get a monstrous kick from the central nervous system, through MASSACRA® Shot & NervTransUP, the intensity increases dramatically, which use oxygen as well. You can not be prepared for it, but we are attaching the Insane Pump System components supporting the production of nitric oxide in the conditions of reduced supply tlenu- pump instead of decreasing, with the progress of the effort begins to increase and the more you wind up fighting with scrap iron. Run are also extracellular buffers the body responsible for the efficient transport of cumulative, acidifying protons, organs excreting them. Plasma volume starts to increase, and the power conductor cables and push the skin. The same thing they do harden as reinforced muscle. Risk of muscle catabolism is very real with such intense effort. There may be, however, about the speech, not MASSACRA® Episode 3. Nitro Muscle IN is to ensure the maintenance of advantages over catabolic anabolic processes, even in the toughest workout. ARE YOU READY FOR REAL massacre ??? Somewhere in your consciousness awakens fear, accompanied by excitement before another portion Massacry®, after which the friends of the gym may consider you crazy! For you, however, they will open the gates of the best training in life. You can not miss this chance! You think you are able to prepare for it ??? 1-2 serving in the morning on an empty stomach. Ingredients: maltodextrin, nitrate creatine and beta-alanine, L-glutamine, flavors, calcium phosphate, malate, L-arginine, the leaf extract of sage (Saliva officinalis), alpha-ketoglutarate, L-arginine, N-acetyl-L-glutamine , trisodium citrate, sodium bicarbonate, magnesium glycerophosphate, citric acid, acidity regulator -, ethyl ester HCl, ascorbic acid - vitamin. C; acesulfame K, sucralose - sweeteners, caffeine, extract of magnolia Chinese (Schisandra chinensis), glucuronolactone, silicon dioxide - anti-caking agent, nicotinamide - niacin, Actinos ™ - fraction whey protein isolate, coloring: beta-carotene, riboflavin, carmine ( for taste BLOODY RED ORANGE), carmine (for taste HELL'S BERRIES), riboflavin (for flavor ANGEL TEARS), an extract of the fruit of cayenne pepper (Capsicum annuum), an extract of the fruit of black pepper (Piper nigrum), thiamine hydrochloride - vit. B1. Prawdziwa MASAKRA a pompa mięśniowa nie z tej ziemi! !